Finding the way to top stainless steel cookware is no joke. This is because stainless steel can assure that the food you are cooking remains healthy for your family. The reason for this can be found in its make which does not react to acidic food. This is one the biggest reasons why even top professional chefs use this cookware to cook food. 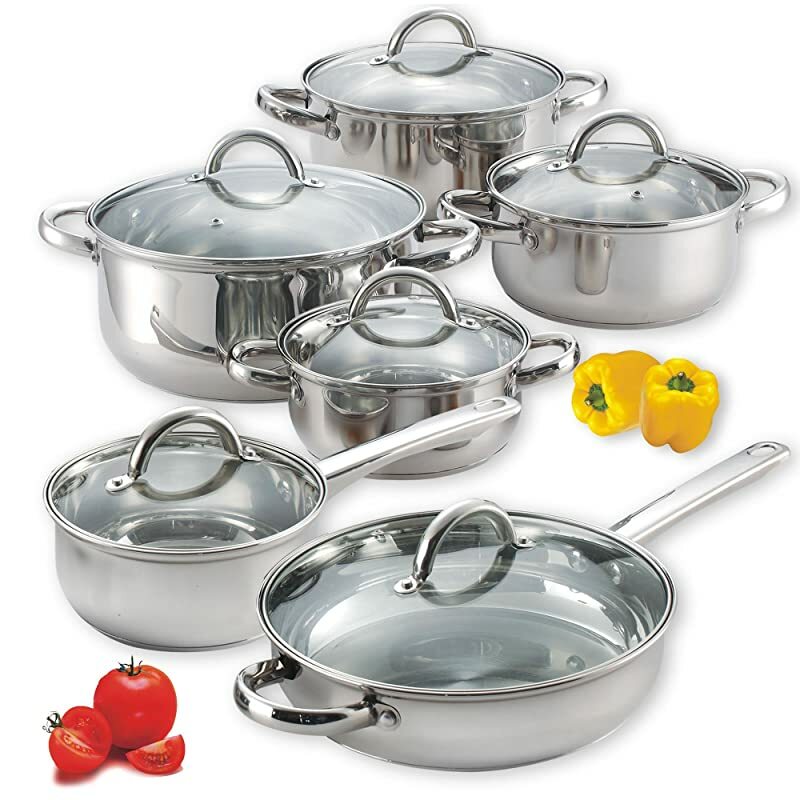 In best stainless steel cookware increases efficiency and at the same time can keep the food nutritious. 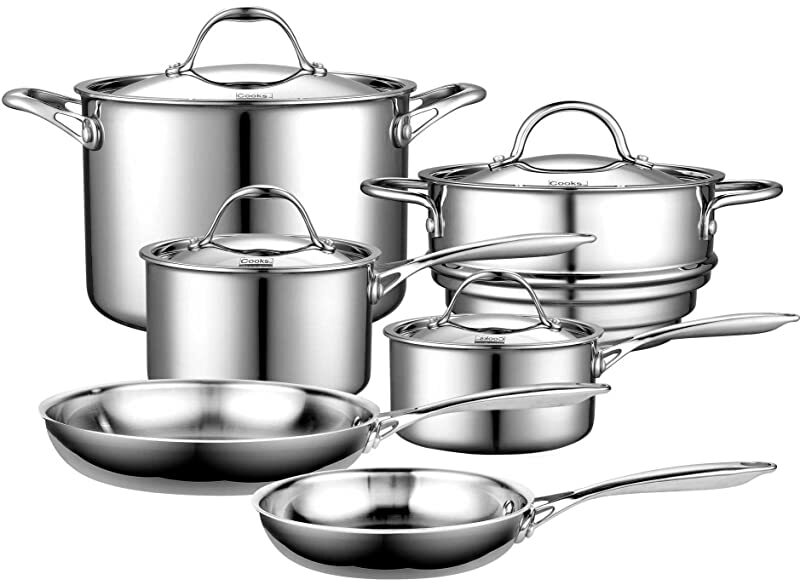 In general, stainless steel cookware is more of a favored item when it comes to professional cooking also. In fact, the ones that have copper aluminum base are more popular as these get heated faster. Another remarkable feature of stainless steel is that it can perform the task of browning very well. This is because these pots and pans can cook evenly on gas as well as electric cooktops without much of a difficulty. Yes, but make sure that to use oil in the right amount to avoid food getting sticky at the bottom. 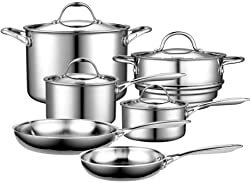 Below is a list of stainless steel cookware reviews that can help you further with choosing the right one for you and your family. The MultiClad Pro by Cuisinart is a range that is designed for professional chefs with a triple-ply make. What this means is that it has an aluminum core and stainless steel interior and brushed stainless exterior. This suggests there is a combination of metals that have been discreetly brought together to cook food faster. Since it is made up of stainless steel the original flavors of the food are kept intact. Additionally, it has a drip-free design that ensures that food does not spill over. Cuisinart itself is a brand that is well known for its French oriented designs that have served the industry for 30 years now. They have been manufacturing innovative cookware ever since their inception. This present series in the discussion is no exception to this rule. Cuisinart has been into this business for 30 years now that makes it a pro at what they do. They really know their design and the Chef’s Classic Stainless is a dishwasher safe range that needs no introduction. This range from Cuisinart can be used on the stovetop, in the oven, and under the broiler too. It has a perfect balance that originates from well-riveted stay cool handles. It has a nondrip rim which makes sure that food gets transferred easily. It has even heat distribution based on the aluminum base that eradicates hotspots of any kind. This is a versatile cookware set that looks good and performs even better with good gripping handles. It is the ultimate cookware set for regular cooking or even for a hoard of people. Cooks Standard adds a certain amount of thoughtfulness to their products and services that have received appreciation from professionals as well as home makers. The reason for owes to its sturdy stainless steel built with aluminum core. In fact, this is what they have named as Multi-Ply Clad metallic construction which has surgical grade stainless steel (18/10) merged with this aluminum base. This ensures even heat distribution in a logical way and improves cooking. Additionally, this cookware can be used on gas, electric, oven, ceramic and even induction cooktops. The long handles sport a V-shape that makes use of air-flow technology is a remarkable feature of this brand. Yes, this is dishwasher safe that means it supports effortless cleaning in the best possible ways. This cooking series from the house of T-fal is a great boon for many. It has a copper base that helps in even heat distribution. Its well-riveted handles are ergonomically designed that make it secured. It has to be added that it is dishwasher safe and can be cooked on all surfaces, yes including induction. It comes with a lifetime warranty that takes the cake away. These pots and pans are easy to clean as well much against the popular notion that steel is sticky. It is an ideal set of cookware for daily use that can take a lot of pressure. Moreover, it has to be added that T-fal is a popular name in major households because of its state of the art designs. This series is a live example of their hard work. This best stainless steel cookware set from the house of Cook N Home is a great investment for those looking forward to a durable range. It has a mirror finish that adds to its charm for sure. It has an aluminum base for even heat distribution, comes with comfortably designed handles that are well riveted make all the difference. It is suitable for all cooking on electric and gas tops only. Moreover, this makes cooking as well as cleaning super easy for users that complement its significant features list. It looks good and as per customer reviews also it stands out by performance. Most users have found the pots and pans to cook in a different way that of course is meant in a good way. 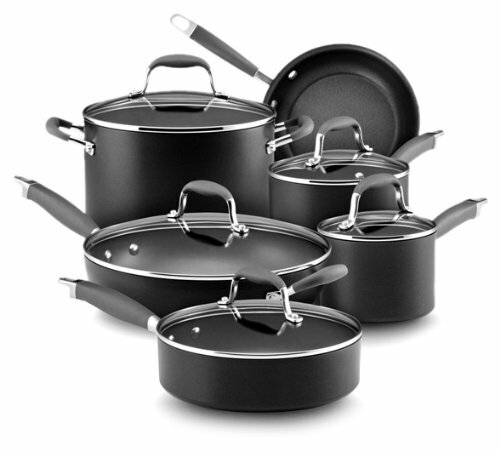 Like any other Cooks Standard, this collection is also is built with Multi-Ply Clad technology. This technique blends 18/10 stainless steel of surgical grade with aluminum which acts as the base of the cookware. As a result, of this cooking becomes more efficient with heat being distributed evenly. It traps the heat and keeps moisture in tact that makes food nutritious without a doubt. The handles are long handles are riveted tightly and are designed with V shape in support of the air-flow technology. This makes them sturdy and also gives you a good grip. Above all this it has to be stated that Cooks Standard is a real standard for the whole cookware industry to look up to for sure. A company that has been 30 years into this business requires no introduction and Cuisinart indeed is one such popular name. 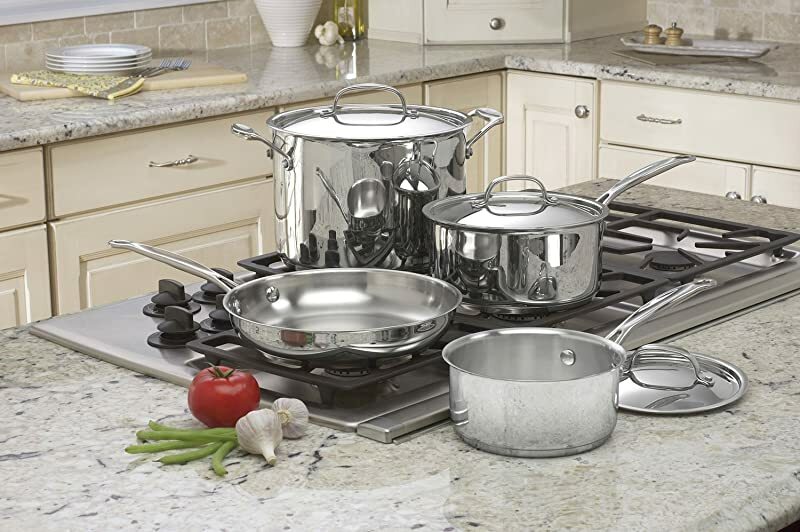 The present collection of cookware has a mirror polish finish that not only looks good but also cooks well. It has an aluminum base that makes even cooking with proper heat distribution. Furthermore, it has well-made stay cool handles that are riveted compactly to the body. It has dripless rims that make pouring so very nice and smooth. It is built in compliance with the North American Electrical Standards. 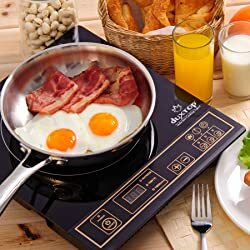 So it is ideal for everyday cooking and can be used to cook delicious food from breakfast to dinner without a second thought. This is a dishwasher safe range that makes maintenance undemanding too! A product that offers lifetime limited warranty in the cookware industry is very hard to find and this range by Duxtop is one such gem. 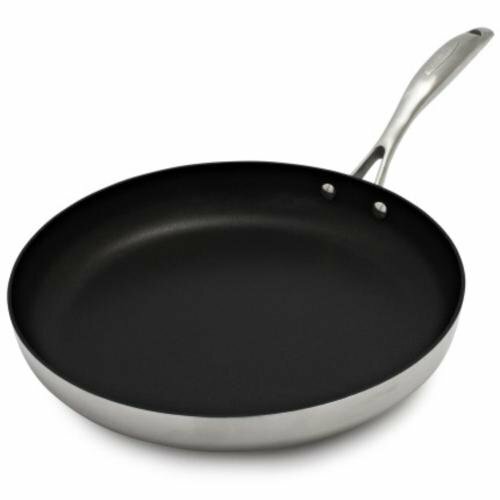 Constructed with 18/10 commercial grade of stainless steel and bonded with aluminum which is the base of the cookware renders it great cooking tool. 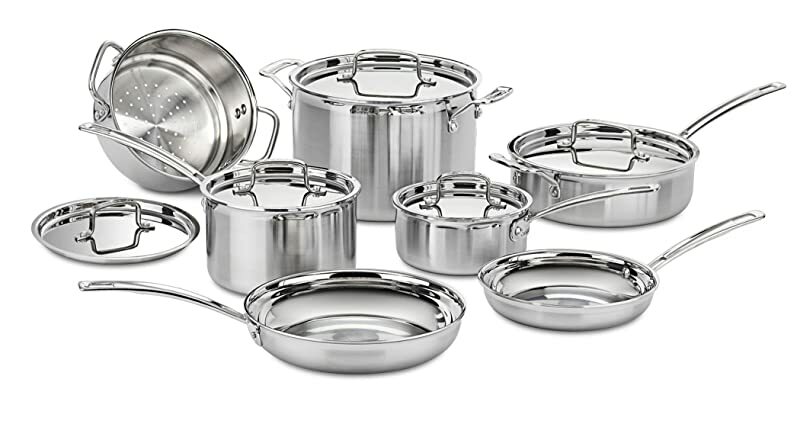 We had no choice but to feature it in this discussion of stainless steel cookware reviews because of its high performance based on this construction. It has sturdy well-riveted handles that are ergonomically designed with an anti-slippery satin finish. This is can be cooked on electric, oven, gas and induction cooktops with ease. It has to be brought to attention that this series is dishwasher and freezer safe that lend it an easy to clean and storage functionality. Calphalon makes sure that cooking is fun and can be equally enjoyed like any other activity. It has been serving this line of business for 50 years and has accumulated huge experience that has evolved into this Tri-Ply Stainless Steel range. This collection has 2 layered stainless steel in combination with the heavy gauge of aluminum that is the base of this cookware. This helps in browning and cooking in an evenly distributed manner possible. The stay cool handles are well secured and this range is oven, broiler, and induction safe. This is also good to go into your dishwasher that means cleaning is no more a problem. It is corrosion resistant that indicates it to unquestionably last longer. All-Clad Metalcrafters was founded in 1975 and ever since then they have been the top preference for chefs worldwide. This series under discussion is constructed with 18/10 stick-resistant stainless steel which does not react with food and has an aluminum base to ensure even heat distribution. This is good for any kind of cooktop including induction and oven. It is also dishwasher safe and yes being stainless steel does not mean that it cannot be washed into it. Handles are permanently and tightly riveted that make everyday cooking really fun filled. Moreover, the set has pieces that are unquestionable to be considered perfect for everyday cooking. With proper care and maintenance, these can positively last you for long. These are a set of amazing pots and pans from a name brand that has drawn only positive reception over time. 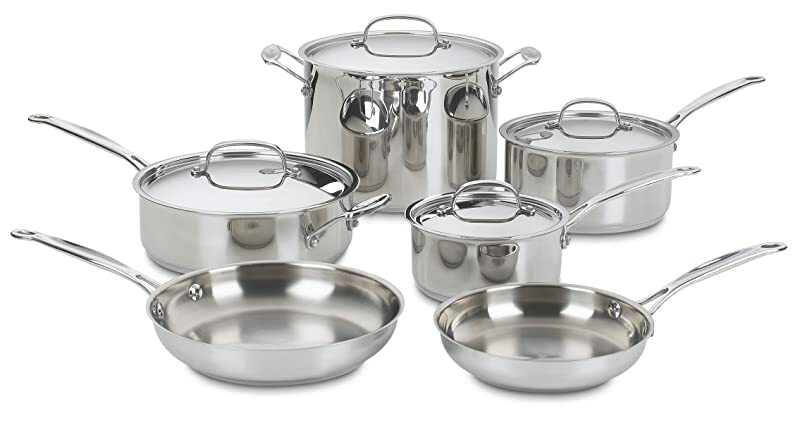 In short it has to be stated that best stainless steel cookware is not about price but more of quality. So while buying a stainless cookware range you need to look into the brand along with its performance for good. Following all this can certainly help you find a long lasting cookware for sure.